Saturday, May 18, departing at 7:30am (7:00am from the subway). Cost: 390 RMB (350 RMB for members); Difficulty Level 5+. 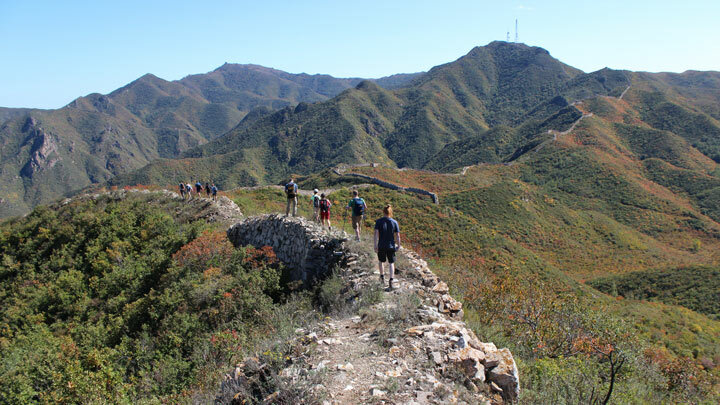 In Brief: A challenging day hike that follows trails through the hills in a remote corner of Beijing, peaking at a Great Wall tower 1,440m above sea level. Long views of Great Wall in the mountains of Yanqing District, Beijing. 6–7 hours over around 17km. Suitable for fit and experienced hikers, and we're going to ask you some questions about your hiking experience as part of the reservation for this hike. We’ve hiked this route before as a two-day backpacking trip, and we also like to do the two hikes separately. For today’s hike we’ll travel light and do the whole lot at once, joining together our Yanqing Great Wall route and our High Tower route. For parts of the hike we'll be on rough and rundown sections of Great Wall, but for most of the day we'll be on hill trails that meet up with the Great Wall every now and again. 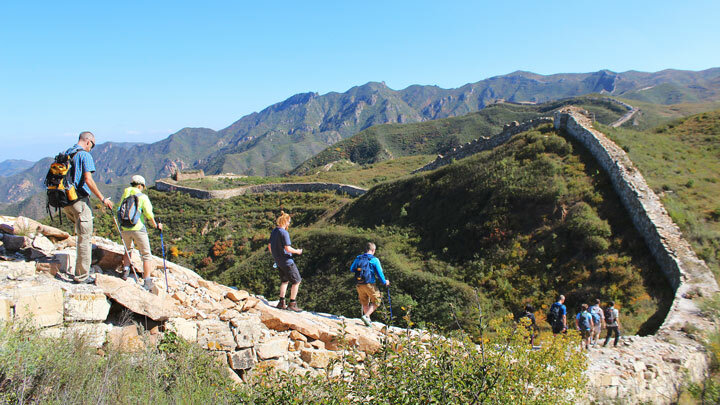 This first part of the day’s hike will have us following the Great Wall from west to east as it rolls over hills and ridges; there will not be much flat walking. Many sections are quite dilapidated, so we will detour around these on paths that cross terraces and fields that are worked by local farmers. Looking north, we should have a good view of the Guanting reservoir. 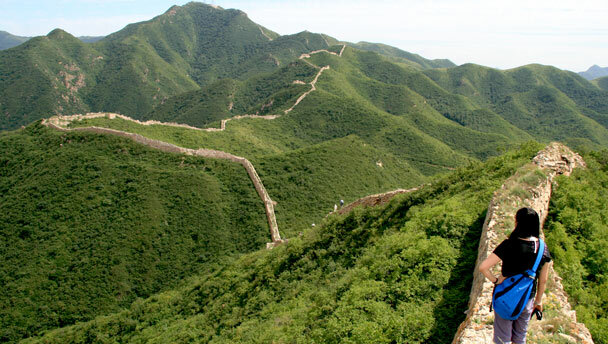 The wall in this part of the mountains is built on high ridges, and because we’ll be on some of the highest of these we’ll get great views of long stretches of Great Wall as we’re walking. Other interesting sights include several round watch towers, a tower made from mud bricks, a ‘water pass’ with extremely steep sections of wall on either side, as well as mysterious valley paths, apricot orchards, a range of vegetation, and a radar station. 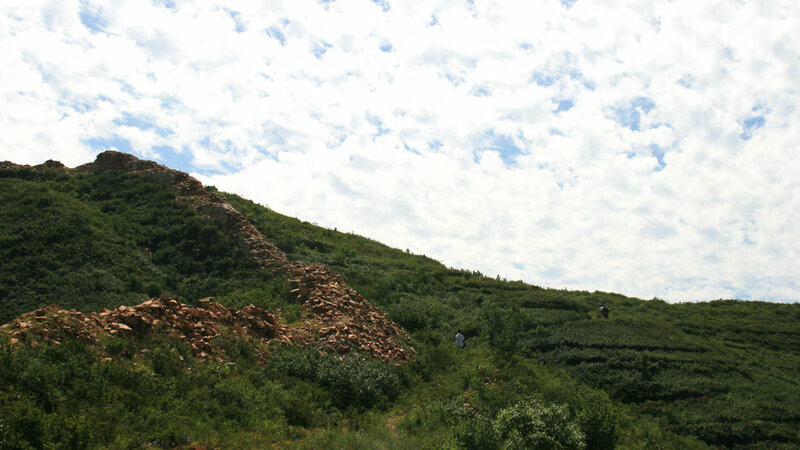 Eventually, we will come to a road the marks the boundary between Hebei Province and Beijing Municipality. The boundary marker is also the trailhead for a route down to a small village hidden in the hills. 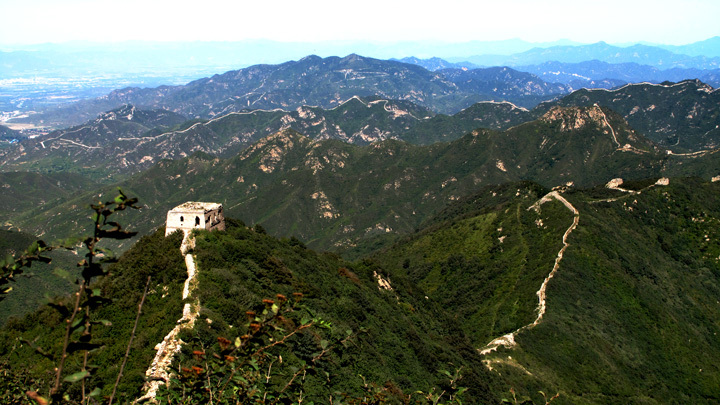 Today, however, we’ll be continuing on up towards one of the highest towers in Beijing Municipality. 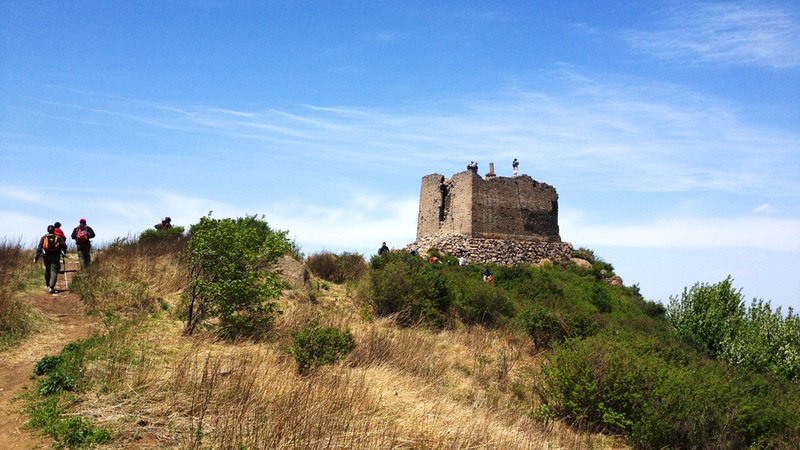 The trail goes along the side of a fairly steep slope before coming out onto a plateau where the High Tower sits. We'll stop at the top for a break and to enjoy the views before heading on again. On the way down, we cross a broken and slippery section of wall, and then follow it down for a little while before turning on to a zig-zag hill trail that leads down to the village roads and the carpark where we'll meet our bus. We'll bring along our beer box and tables for a little post-hike picnic before we head back to the city, hopefully arriving in Beijing before it's too late for dinner! This hike is suitable for fit and experienced hikers, and we will be setting a fairly quick pace to make sure we finish in time. 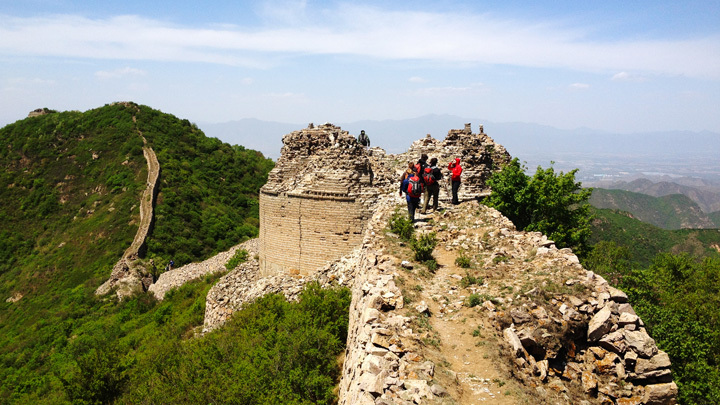 If you haven't done long tough hikes recently, or are more looking for a tour of the Great Wall, you might have more fun on one of the other hikes this weekend. When the AQI in Beijing is as low as 8, you know the views in the mountains are going to be amazing—see 31 photos from the Yanqing Great Wall and High Tower hike. 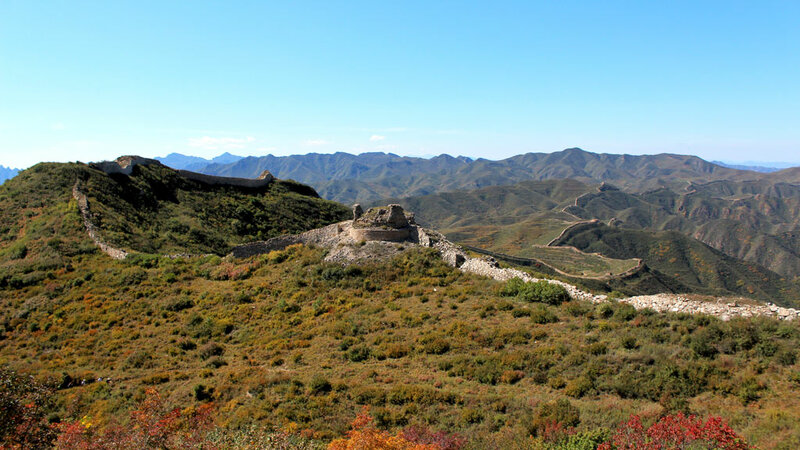 Twenty-seven photos from a challenging walk along the Great Wall, up to a high tower in the hills, and then down a wild valley. 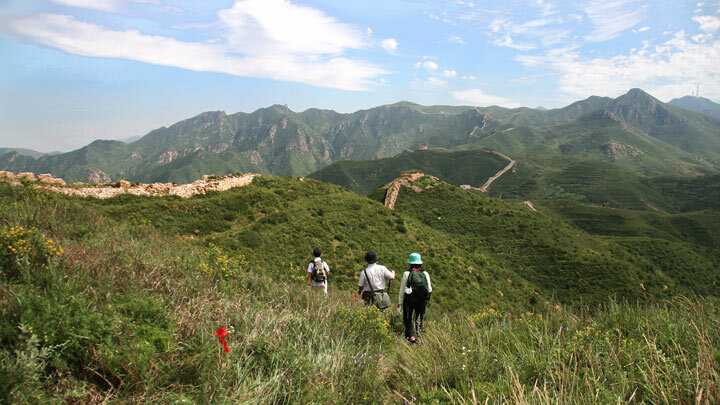 Beautiful views of autumn foliage on this hike through the hills of Yanqing County.